Amy: I wish you were here. Sheldon: At a microbiology conference? What a mean thing to say! 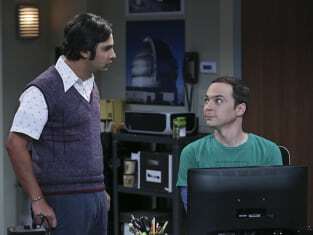 Sheldon: Aww, you always know just what to say, after I tell you what to say. Permalink: Aww, you always know just what to say, after I tell you what to say. Koothrappali: I should warn you: it's just looking at data for hours and hours on a computer screen. Sheldon: Stop selling it, kid. You won. Permalink: Stop selling it, kid. You won. Leonard: I'm not going to make a fake appointment with a psychiatrist. What would I say is wrong with me? Penny: Denial. See sweetie, the list goes on and on. Permalink: Denial. See sweetie, the list goes on and on. Gallo: I'm curious. Are you related to Dr. Beverly Hofstadter? Leonard: She's my mother. Do you know her? Gallo: Not personally, but I have read all of her books. Leonard: Then you know her better than I do. Gallo: Well I'm not so sure about that. But I can tell you I do not agree with her theories on child rearing at all. Leonard: Really. Any chance you find them cold, cruel and unsuitable for Innocent little boys who just want to be happy? Leonard: No, say it! Say it! Rent a plane, write it in the sky. Permalink: No, say it! Say it! Rent a plane, write it in the sky. Leonard: Right? To this day I send her a card every year with a little money in it. Permalink: Right? To this day I send her a card every year with a little money in it. Bernadette: He tried to deny it but his teeth were all purple. Bernadette: Ew, we are missing him! Permalink: Ew, we are missing him!